Using patented Coherent-PMD technology, the NRT-96083X programmable PMD Source generates deterministic, stable and repeatable 1st, 2nd and higher-order PMD states. 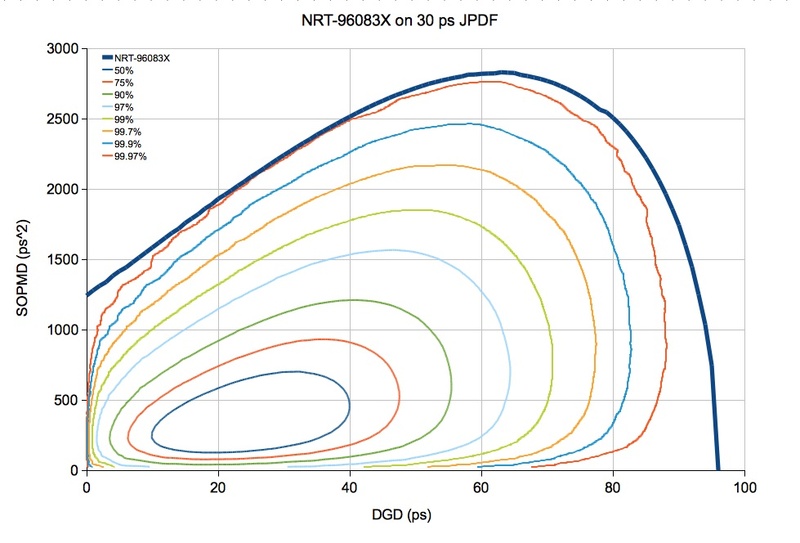 The NRT-96083X employs a totally new optical architecture to increase the DGD range while maintaining a wide PMD spectrum. Dual polarization and advanced modulation format 40 Gb/s and 100 Gb/s DSP equalizers, transponders and systems can be comprehensively characterized in a matter of hours with rapid, repeatable, quantitative and reliable PMD tolerance testing. The NRT-96083X PMD Source takes the guess-work out of specification and certification of mission-critical network systems. You know the route that your system is to be deployed on, and you know its PMD profile. But do you know if your system will work on the route? Can you quantifyably prove it to your customer? 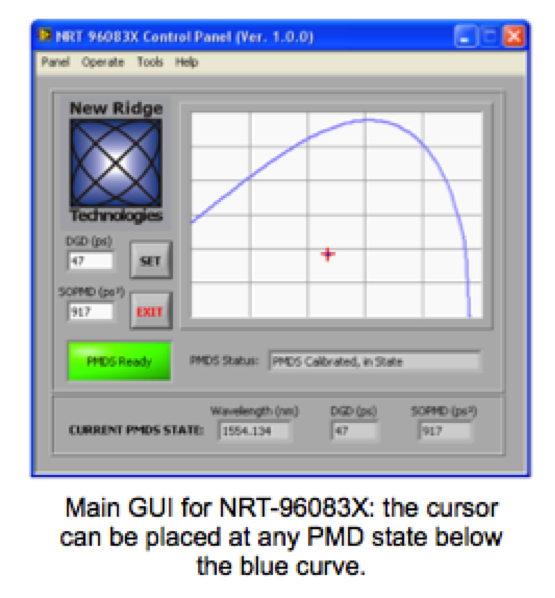 The NRT-96083X allows you to quantify your system performance with realistic PMD stress before the system is deployed. 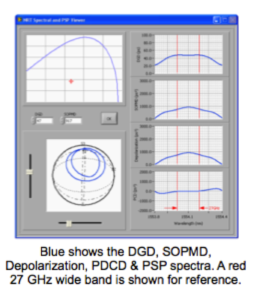 And unlike other statistical PMD emulation methods which are not repeatable and non-deterministic, or emulators that can only generate unrealistic wavelength-flat states of DGD and depolarization, only NRT‘s PMD source generate realistic and deterministic PMD for complete, efficient, reliable, repeatable and quantifiable PMD characterization. 1. Comparison between various signal modulation formats at different line speeds. 2. System Qualification and Certification. 3. Digital signal processor based equalizers and digital-CDR development. 4. Reliable PMD Source to Calibrate PMD Measurement Equipment. 5. Network Development tool based on outage probability. 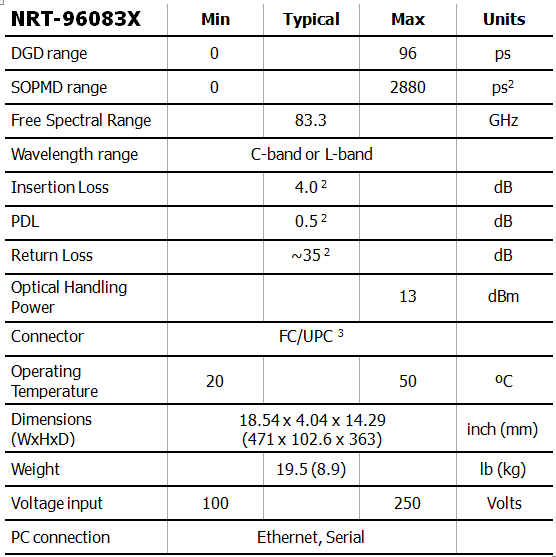 The NRT-96083X PMD Source is programmable. 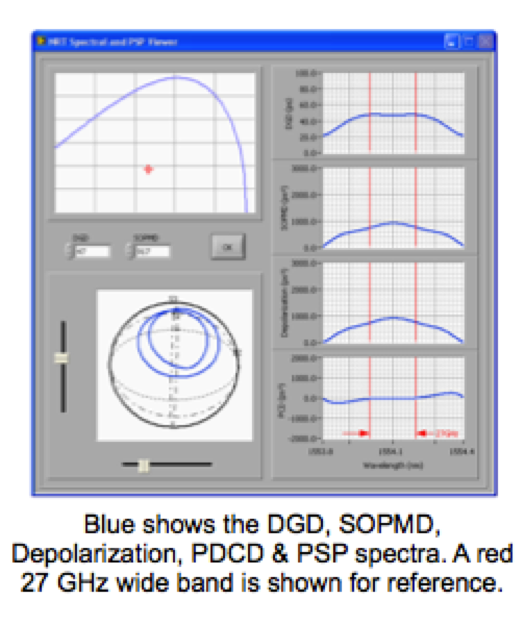 The GUI allows you to set DGD and the Depolarization and Polarization Dependent Chromatic Dispersion (PDCD) components of SOPMD. With our improved GUI interface you can select the ‘coordinates’ for any PMD state. The PMD spectrum is displayed in frequency and in Stoke space. Capture the spectrum you want, and load it into the instrument for testing. The NRT-96083X covers >99.97% of the states occurring in a 30 ps mean PMD fiber span. The joint probability density function of a 30 ps fiber is shown by the rainbow colored contours in the figure above. The NRT-96083X can access all states below the dark blue curve, beyond the outmost 99.97% (red) contour. This wide DGD/SOPMD range, combined with the broad 83 GHz free spectral range enables the NRT-96083X to test, compare, design and deploy transponders having the most advance modulation formats at 40G, 100 G and beyond. 1. NRT-PMDR, PMD Randomizer, turns any NRT PMD Source into a dynamic fiber emulator. Due to our patented coherent PMD generation technology the NRT-PMDR is also the only deterministic fiber emulator, enabling you to always know the state of the source to correlate with system bit errors. Furthermore, you can set the NRT-PMDR to emulate any mean fiber PMD level. 2. NRT-OPC, Outage Probability Calculator is an upgrade to our NRT-TOPC. This (post measurement) data analysis tool calculates the total outage probability for the measured transponder/system for any level of fiber PMD. Moreover, the NRT-OPC calculates the statistics for outage durations and time between outages. 4. NRT-JPDFC, Joint Probability Density Function Calculator generates a topographical contour map of the PMD probability in 2-D PMD space, namely DGD vs. SOPMD (as shown in the figure above). 5. NRT-2500 is a polarization control platform designed scrambling, randomizing, setting and especially for implementing very fast and very reliable polarization tracking applications. This product can be used to set or scramble the SOP input to the NRT PMD Source to dynamically change the PMD stress or after to verify your polarization demux. 3 Other connector types are available.